On the Sunday after Christmas children who come to worship (not unlike the adults who come to worship) will not be many in number and will be coming in many moods. Some will be basking in the rosy glow of a happy Christmas. Others will be deeply disappointed either because they did not get what they wanted or gatherings were less than peacefully cheerful. Some will have landed with a thud in post-Christmas and are waiting for things to get back to normal. Others are just tired – and maybe cranky. Christmas is so very over and won’t come again for a year. But, because numbers are low and expectations are not what they were for earlier December worship services, it is a relaxed Sunday with the possibility to try a few somewhat different ways of praising God and responding to the Christmas story.
] The first task is to sort through available texts. If you will celebrate Epiphany on January 5, you might want to use the Second Sunday of Christmas texts (i.e. the prologue of John) today, saving all the magi stories for Epiphany. 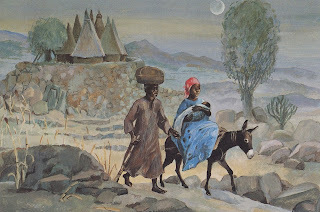 Or you might use the magi and flight into Egypt story as an entry into exploring “after Christmas realities” today and then retell the magi story to explore Epiphany calls to rise and shine next week. OR, you might ignore all the Christmas Sunday texts and work with the New Year’s texts. There are lots of good possibilities for children as well as adults!
] Some congregations devote this Sunday to an after-Christmas Day lessons and carol service. Often before Christmas we focus on the details of the stories the carols tell. Just after Christmas Day explore messages the carols give us to take into the year before Christmas comes again. Interrupt the congregation's singing of “Joy to the World” after the second verse. Note that we know the first verse and the second is a simple call to sing our praises. Then insist that we often stop paying attention to the words of the later verses in a song. Walk worshipers through the last two verses. Verse 3 is another task (harder than singing) for us – “No more let sins and sorrows grow.” Verse 4 is a promise to us as we work on verse 3 – “He rules the world with truth…and wonders of his love.” This done, invite everyone to sing the song challenging them to sing from the beginning all the way through the end. “Once in Royal David’s City” tells the big story in words that many elementary readers know. Help them get the message by walking through the verses with open books (or the words on the screens). 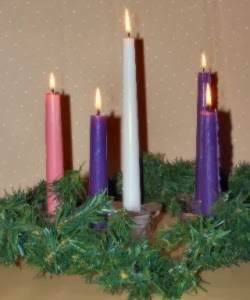 Go to Fourth Sunday of Advent (Yr A) for details. 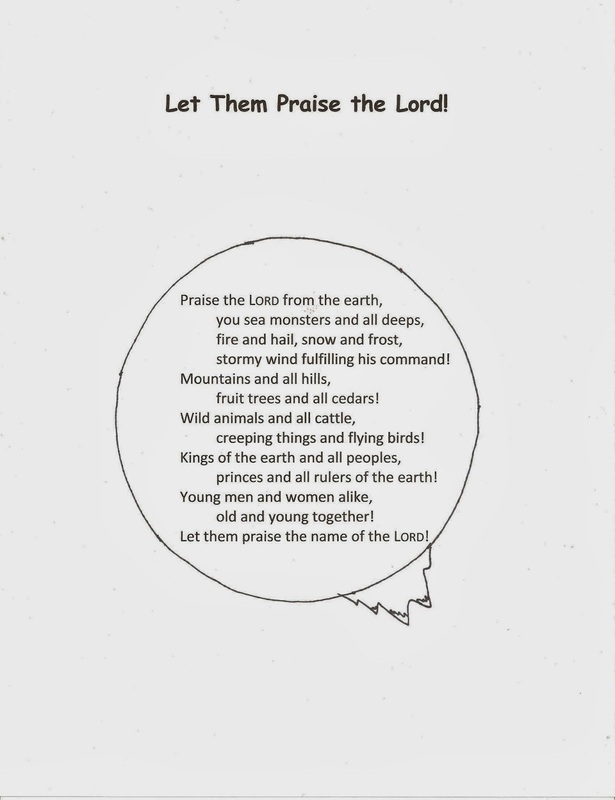 Sing “What Child Is This?” with one group singing the questions in the verses and another singing the answers in the chorus. A choir could sing the verses with the congregation responding with the chorus. Or especially if it is a choir-less Sunday, two halves of the congregation could be the two groups. Isaiah’s poetic words are probably here today to connect to incarnation. It seems to me other texts speak more clearly to children.
] On the Sunday after Christmas recall the Christmas story, then enjoy calling on everything in the universe to praise God for this amazing deed. Instead of having one reader, invite as many as possible in the sanctuary to get involved in this call to praise. Here are two potential scripts. In the first one, the lines to be read are shorter and so easier for young readers. The second one follows the psalmist’s division of calls to those above the earth and those on the earth with one group reading each set of calls. In either, Group 1 could be the choir and Group 2 the congregation. Or, Group 1 could be the left side of the congregation and Group 2 the right side. Invite children especially to join in the reading since the words are words they are likely to know. 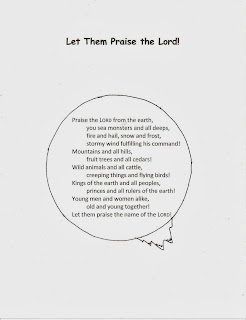 Psalm 148 – Let all praise God! Feel free to copy this for use in worship.
] “All Creatures of Our God and King” sets the words of St. Francis of Assisi to music. St. Francis was surely remembering Psalm 148 as he wrote it. 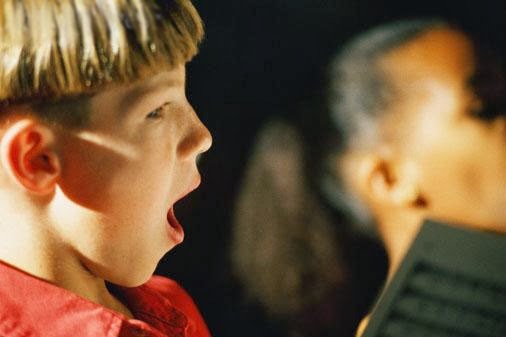 The repeated “Alleluias” are easy for even non-readers to sing and recall all the Christmas “alleluias.” Other hymns based on this psalm are harder for children to sing.
] Children will miss this abstract text almost entirely. 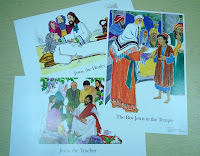 If you want to explore the incarnation in children’s terms, go back to the suggestions for The Fourth Sunday of Advent. Again check out the walk through guide for "Once in Royal David’s City.” That hymn might be a better way to explore incarnation than these words. been pulled from the box when I took this photo.
] “Christ is Alive, Let Christians Sing” is an Easter hymn with words that older elementary children understand and can sing along on. Today sing verses 2, 3, and 5 to celebrate the fact that the story of Jesus’s birth is not something that happened long ago and far away but affects our lives today. Review these verses before singing them together. 2. Christ is alive teaching and healing today. Name some of the healing and teaching your congregation does in Jesus’ name. 3. Jesus is not far away in heaven but is with us and among us every day. 5. The good news of Jesus’ birth is as much good news today as it was then. The whole world in every time and place is called to respond to God with us.
] Children hear this horrifying story most easily when the emphasis is on the flight into Egypt rather than the slaughter of the children. One way to tell it is to work with a crèche. Recall the Christmas story and how almost magical the night was. Then announce that the story did not stop there. Remove the angels noting that they went back to heaven. Set the shepherds aside noting that they went back to their sheep in the fields. Touch the three magi, noting that they did not sleep well that night. They had a dream in which God told them King Herod was really jealous of the new king and was ready to try to kill the baby. Given this God said they should go home without stopping off to tell Herod where Jesus was. Move their figures off to another side and note that they did as God told them. Now go back to Mary, Joseph and Jesus. Tell the children that they did not sleep well either. Joseph had a dream in which God warned him that Herod was out to get the baby. So, they were to get up right then, in the middle of the night and head down the road to Egypt. Move their figures away from the central place. Explain that they stayed in Egypt for two years. It was not an easy time for them. After two years they started back home, but God warned them that the King who followed Herod was just as evil as Herod was. So, instead of going back home, they settled in the little town of Nazareth. PAUSE. SIGH. Admit that this is a sad follow up for such a wonderful Christmas in the stable story. It would be nice if everyone had gone happily home and watched Jesus grow up safe and secure with angels watching over him and no problems for anyone. But it didn’t work that way. It doesn’t work out that way for any of us. We all have all sorts of problems to worry about and work on. The good news in this story is that God knows that. Jesus’ family had to run away in the middle the night to escape an evil king. So God understands when we and our families have scary problems. God is with us and loves us not just when things are Christmas Eve wonderful but also when nothing is going right. Right now, on the Sunday after Christmas, that is really good to know. Christmas is over for this year. We still have New Year’s Day to look forward to. But, soon it’s back to school and all the old problems and people we will struggle with. It’s a good time to remember that God was with Jesus and his family in the peaceful stable AND on the scary road to Egypt.
] Look at this picture of the flight into Egypt and compare it with photos of current refugees from National Geographic or other sources.
] Especially if your congregation is active in ministry to refugees in your community, explain that Joseph, Mary, and Jesus became refugees. Compare their experiences in Egypt where they were foreigners with the challenges refugees in your community face. Talk about some of the ways your congregation reaches out to refugees. Suggest at least one specific way that families can take care of refugees during the last days of Christmas vacation as an “after his birthday” birthday present for Jesus or a good New Year’s resolution in Jesus’ honor. One church planned a morning service project for children and their families during the week after Christmas. Families that were in town and needed to get out of the “what are we doing for the holidays next” mode really appreciated it. This would be a good year to pack relief kits for refugees from the wars in Syria or Africa.